On Thursday, January 15, The Red Door in Mission Hills will host the second installment of its Farmers, Friends & Fisherman dinner series. This quarter's supper club features a marriage of Baja cuisine by Executive Chef Karrie Hills and guest chef Flor Franco of Zarco Comida de Baja, as well as Baja wines curated by Fernando Gaxiola of Baja Wine + Food and The Red Door's own wine guy Mark Wheadon. Also in attendance will be San Diego fisherman Dan Major, as well as representatives from Spur Valley Ranch and El Campito Farm. 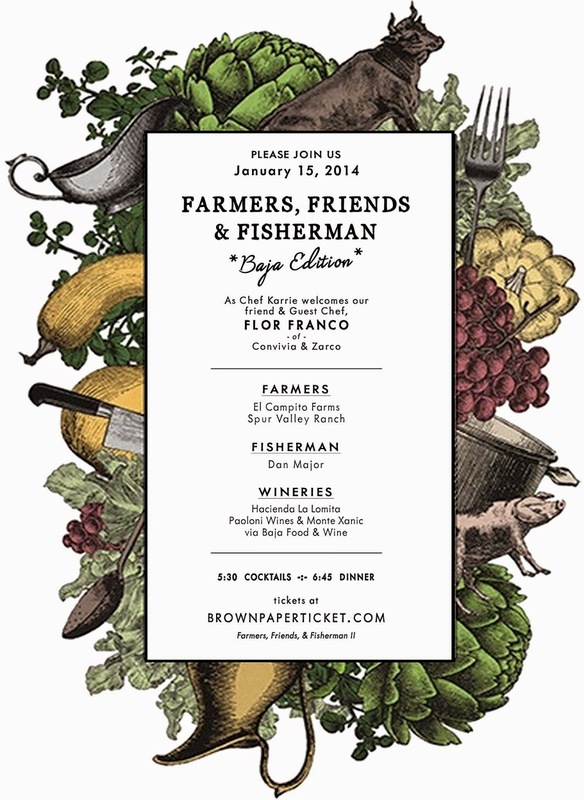 Tickets to Farmers, Friends & Fisherman are $80 for dinner and wine pairings, but do not include tax and gratuity. Facetime with the farmers and fisherman and a cocktail hour take place from 5:30-6:30pm, with the 4-course tribute to the work of our local farmers, fishermen and winemakers taking place at 6:45pm. Produce for the meal will be sourced from The Red Door Family Garden and wines will come from Hacienda La Lomita, Paoloni Wines and Monte Xanic. To purchase tickets to the dinner, visit brownpapertickets.com/event/986144, and for more information, visit thereddoorsd.com.